Inez (right) alongside her husband. Inez Wong is a rich human who owns the western hemisphere of Mars together with her husband Leo. They farm buggalo at their ranch. Inez is similar to her husband being selfish and greedy. She is also overly concerned about Amy's choice of Fonfon Ru and was obsessed with getting a grandchild. Apparently, she cares more about having grandchildren than the happiness of her daughter. As soon as their Buggalo were stolen, Inez claimed she wanted to divorce Leo indicating that she only married him for his money (3ACV10). Inez married Leo Wong, a rich owner of a majority of Mars, and they had a daughter, Amy, in 2979. 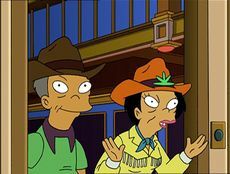 While Amy went off to study at Mars University and becoming an intern at Planet Express, Inez has stayed at Wong Ranch breeding buggalo. In 3010, she protested against Proposition ∞ after her daughter started a robosexual relationship with Bender (6ACV04). Inez and Leo had a habit of meddling in Amy's life frequently trying to get her together with a man in the hopes of getting grandchildren. They disapproved of Amy's relationship with Kif Kroker (3ACV10), even though they were the ones who found him (1ACV10). Sir Reginald Wong, Leo's paternal ancestor who bought Mars from its natives with a bead. She is one of the few characters on the show other than Amy voiced by Lauren Tom. She often describes Kif as "squishy". In her first appearances, Inez was shown to be able to speak perfect English in spite of her intense Asian accent, but this trait later disappeared (3ACV10). She has only appeared twice without her husband (US#034, BG). Inez, along with her husband and daughter, speak Cantonese and English, with Mandarin occasionally slipping in (6ACV04). Counting the opening sequence from Bender's Game, she is one of few non-primary characters to appear in all 4 films. Inez: Come on, Amy! Pick a male human already! [There is a line of men standing near the porch.] I want to be a grandmother nine months from five minutes from now. Amy: Cut it out, Mom! I'm not interested in any of these gross, ugly losers. Fry: [Walking up.] What about this gross, ugly, smelly loser? Leo: Fry! What you doing here? Leo: Look at all that awkward winking. Inez: It must be love.